Hang on, isn’t that already in the Road Code? No, the Road Code only has a best practice guideline that you should give a 1.5m gap when passing. This proposal would make the 1.0/1.5m gaps mandatory. Pfftt! Who has that kind of rule? Actually, quite a lot of places. Local interest was particularly sparked when Queensland introduced a similar rule about two years ago. Since then, South Australia and ACT have also followed suit across the ditch. Similar 1.5m rules are also common in Europe, including France, Belgium, Portugal and Spain. 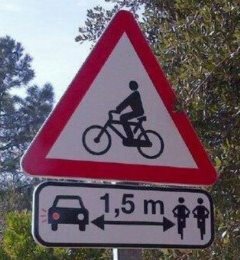 And in the US, most states have some kind of rule specifying safe passing behaviour, often with a 3 or 4 foot minimum distance. Safety, both actual crash safety data and perceived safety of riders, is the main reason. A lot of cycle crashes, particularly in rural areas, involve motorists not passing riders with sufficient space or trying to squeeze past with oncoming traffic (often there is a misjudgement about how fast a rider is actually travelling). Most rural cycle fatalities for example are on roads with little/no shoulder. And for many people who would like to ride a bike, they are put off by motorists passing them too closely, particularly when at speed. Try standing on the side of a road while a large truck thunders past you closely at ~100km/h. As well as the noise, the air displacement and vibration can be very unsettling and potentially enough to knock over a rider (or at least affect their balance and riding direction). 1.5m provides a safe margin for error in case the rider does encounter problems, whilst also reducing the chances of that happening in the first place. So how is anyone going to exactly measure 1.0/1.5m? Will Police officers have measuring tapes? The point of the law is not to prosecute someone for passing a bike when only 1.49m away (in the same way that most people driving at 101km/h don’t get ticketed either). But it does provide Police with a clear legislative backup in the case of situations where the motorist was obviously too close (e.g. well less than a metre away). The other useful advantage of introducing such a law (as evidenced already by the public debate) is in raising awareness to everyone as to just what constitutes safe and appropriate overtaking behaviour – in the long run, that may be the biggest benefit. For example, overtake using the next traffic lane over and you will know that you have complied. Can’t the Police already prosecute someone for unsafe overtaking? Yes, they can, if you do not overtake another vehicle “with safety and due consideration for others”. But this proposed rule helps everyone (drivers, riders, and Police) have a more consistent understanding of what “safety and due consideration” actually means. But I’m on a narrow road! By the time I’ve given a safe passing distance I’ll be on the other side of the road! The law actually does allow a motorist to overtake a cycle even when there is a yellow centreline; the restriction only applies to other motor vehicles and “animal-drawn vehicles” (but it is a little-known fact, and work is underway to clarify the Road Code on this). Note that you still have to overtake with safety and due consideration to other road users. Why don’t they just allow cyclists to ride on the footpath instead? Because generally it has been shown to be less safe for cycling (driveways, intersections, other path users) and also creates new problems for pedestrians. Obviously, where appropriate, paths can be designated as shared facilities, but a blanket approval for footpath riding simply shifts the problem somewhere else. Hmm, what if I go past a cyclist fairly slowly? You’re on the right track; that’s why the proposed rule has different minimum distances for different speeds. Personally I would have no problem with a motorist crawling past someone on a bike with only (say) 0.5m clearance if they were only driving at 30km/h (and I would hope that a Police officer would also use suitable discretion in this case); the relative speed would be a lot less, hence the danger would be much reduced. Sometimes I’ll come around a corner and suddenly there’s a cyclist there in front of me. I’ve got not time to slam on the brakes, so I have to pass them. Except that the law requires that you are always able to stop in the clear distance available in front of you. So if you can’t see sufficiently around a blind corner, that’s your cue to slow down before you see the rider. With the exception of motorways, under Common Law a person is entitled to ride a bike on any public road; in many cases, despite the width/terrain/traffic it may be the only way to get to certain locations. That’s not to say that it could make sense to recommend certain quieter/wider/straighter routes as more bike-friendly. But if there really is a concern about safety and delays on a particular route, then road improvements or warning signage are more appropriate solutions. It is pertinent to note that virtually all recent serious cycling crashes involving passing vehicles featured riders already in single file (most on their own). However, cyclists are generally allowed to ride two abreast (and often what looks like three or more abreast is actually an optical illusion). 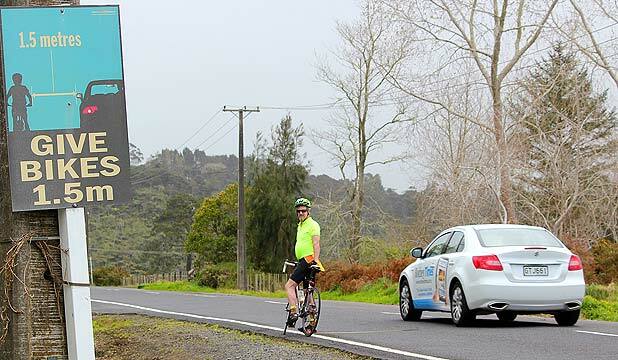 Although there is also an obligation for slower road users to not unreasonably impede other traffic, on a narrow road with little/no shoulder it may be irrelevant whether the riders are one or two abreast – you would still have to use the opposing traffic lane to overtake safely. And there is a reasonable argument that it is easier to overtake a shorter-length peleton riding two abreast than a longer single-file bunch. Actually the legislation requires that all road users travel “as far as practicable“ to the left, not “as far as possible”. The reason for this is that there are all kinds of perfectly valid reasons why keeping to the far left may not be safe for cycling, including debris/detritus on the shoulder, avoiding parked car “door zones”, and narrow lane situations where keeping left might encourage unsafe overtaking. 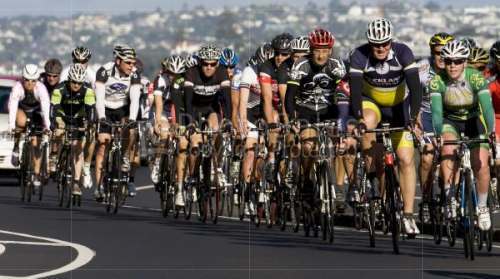 Indeed, the official NZ Cycling Road Code recommends “taking the lane” when appropriate. Meanwhile, that hasn’t stopped riders from being prosecuted for impeding traffic already. No-one is pretending that people riding bikes are perfect, and other education/enforcement initiatives are aimed at improving that. But the simple fact remains that drivers are deemed at fault in the majority of crashes with cycles, and a common issue in many of these crashes (and numerous “near misses” cited by riders) is poor/dangerous passing behaviour by motorists. Except that (a) generally you’re far less vulnerable in your car when a bike goes past you, and (b) riders are typically travelling at a much slower speed, thus reducing the risk of anything happening. That doesn’t excuse a bike rider from having to ride with the same due care and consideration as any other road user though – and that might mean them slowing down a bit while passing cars. In summary: A safe passing distance rule is certainly not a panacea for improving cycling safety or road user behaviour in general. But it is one piece of the puzzle towards providing a more cycle-friendly environment in New Zealand. The Minister of Transport has requested that further research look into the implications of introducing such a law here, so in practice it is not likely to be until at least 2017 before it is mandated in NZ, assuming that the Govt is satisfied with the research findings. What do you think of the proposed safe passing distance rule? The rule should be clear about intersections, where the traffic is moving slower than 20km/h, where cyclists/scooters & motorcyclist should be allowed to move to the front of the que, as they take off at a quicker rate without holding up traffic. Make it compulsory to overtake on the other side of the white line ( if it exists) and then there is no doubt about the 1.5m distance. Especially for trucks whose wind shock even at 1.5m can still blow you off the road. OR only allow trucks to pass bikes while traveling at 70 kmph. 1m in town is fine. So allow closer passing in town if the overtaking vehicle is going really slowly. And write in Police discretion like they did with the anti-smacking law. That will placate a lot of opposition.